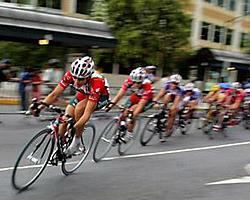 This September marks the completion of the first year of the ValueAct Capital Cycling Team. We have a smaller sized roster, focusing on the NRC calendar and, although based in the United States, we have several members from other countries like Australia (Katie 'Mac-Attack' Mactier, Hannah Banks), the United Kingdom (Sharon Allpress), and Mars (probably the rest of us). As with any unknown endeavor (or cycling team), I think it's beneficial to all involved parties to clearly define objectives from the onset. From the very inception of the ValueAct Capital team values, expectations and goals were outlined and continually re-enforced to us riders at every opportunity. Values were placed on work ethic, selflessness - both on and off the bike - and results arising from team work (if my team-mate Taitt Sato is reading this ...thank you for sharing your Cytomax with me when I'm thirsty). The expectations were to give 100 percent in every race - rain or shine, big or small. As for goals, it was simple: to impact women's national level racing in the most positive way possible for our small, first year team. With all these objectives combined, we had our work cut out for us. But the team's willingness alone to commit to these values, expectations and goals from day one guaranteed our success in women's cycling. As a result, the team grew stronger, both in individual strength and abilities to work together. We won national calendar races when we were the underdogs. The team was given PR opportunities usually reserved for larger teams, like television interviews and diaries on cycling websites. I'd like to think we positively impacted the women's peloton by racing aggressively, being supportive of other riders, and always focusing on the positive while still remaining analytical - all with smiles on our faces. Many of these things aren't easy for a first year women's team. Our highlights from the year included our first NRC win at Mt. Hood Cycling Classic, quickly followed by our second NRC win in less than 24 hours and countless top ten finishes in national calendar races by developing women racers. Along with qualifying for the Bermuda Grand Prix in the Women's Prestige Series, there were also the gratifying smaller things like fighting for jerseys in prestigious tours, lead out trains, big cash primes and controlling races we might not have thought possible. We had our ups and I would be lying if I said we didn't have our downs as well, but as team-mate Courtenay Brown reminded me the other day, the sport of cycling is about the good days, not the bad ones. So for the purpose of this diary let us continue to focus on the bright blue side of the ValueAct Capital team. To top off our situation of success, ValueAct Capital was so enthused by the 2007 season they committed to support the team in pursuit of bigger and better in 2008. Our team director Lisa Hunt has been working night and day in preparation for ValueAct Capital as one of the top three teams in the United States. At this point in the season, I am not sure if her respiratory system can still function without her breathing into a team radio or cell phone. A blackberry might suffice, but is less than optimal. I suspect that the ideal combination might be a team radio in one hand, a blue tooth in an ear, and the laptop in the passenger seat; all while driving the following vehicle in the caravan. The team's dedication to its objectives throughout the year has yielded an incredibly positive and supportive relationship with our title sponsor, as well as attracting to the team some of the highest caliber women's cyclists in the world for 2008. Of course, this has been possible with the support of not only ValueAct Capital, but our super cool equipment sponsors such as Serotta bikes, Reynolds carbon wheels, and Ritchey Logic components as well. In teamwork with all our sponsors and riders, we have laid the foundation of not just a team, but a program that I hope can continue for a long time to support and showcase both developing and top level women cyclists throughout the world.